These guys are the reason I continue to run. My running buddy continues to push me to stay healthy. Therefore, I can correlate my cardiovascular improvement as an inverse relationship to the number of times we have run together (I have no idea what I just said there, but it sounded scientific and awesome, didn’t it?). Bottom line is I still need my running buddy, but I’m to a point where I can survive on my own. I have had several surprises along this journey to better health. I thought it would get easier. I expected to find a sweet spot where the miles would fly by as if I was “born to run.” Truth be told, I still find even the first mile a challenge. Granted, some days are better than others, but while the miles may have got a little less demanding, it has not happened at the rate I had expected. I thought the pounds would simply melt off as I increased in my mileage. The pounds do fall off, but much to my chagrin, they are hanging on for dear life. My clothes are fitting a little bit better, but the changes aren’t as extreme as they would have been 10 years ago. I feel better about my life in general. That’s right, while exercise hasn’t made me Polly Anna, the stress relief I’ve found from running has given me the ability to “roll with the punches” better than I ever have before. It’s the most amazingly unexpected benefit I’ve ever received. 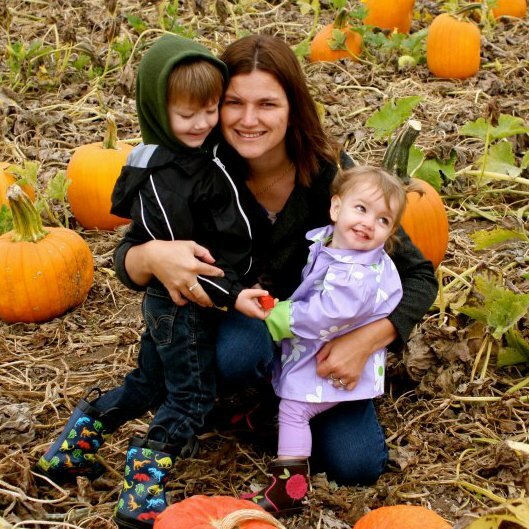 I have two kids and a full-time job, and I’ve found I can handle work and family like a champ! In fact, I’m actually finding I enjoy work more. Some brilliant minds aka “science nerds”, suspect exercise enhances mood by increasing serotonin, the chemical thought to be a contributor to feelings of well-being and happiness. Others theorize that exercise boosts self esteem because of the accomplishment (Yay me, I planned to exercise, it was hard and I completed it), and that exercise trains ourselves to handle stress by stressing the body in a controlled environment. Whatever the reason, I can tell you it’s worked. Sure, the science behind it is there, but I challenge you to find out for yourself. Fitness, losing weight, getting some fresh air…that’s all great. But now, the stress relief is the reason I continue to run. 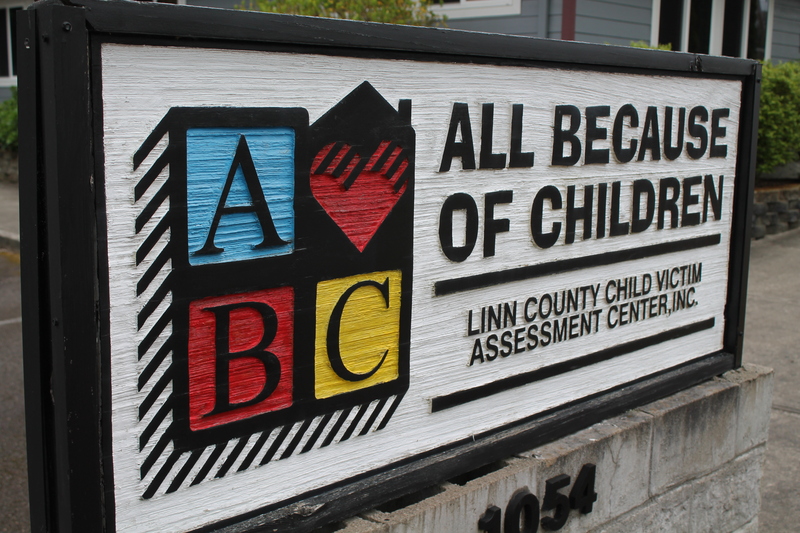 Last year, PacificSource supported the All Because of Children (ABC) House of Linn and Benton County, OR. They sounded like a great organization, but I’ll be honest, I didn’t really know what kind of work they were doing. To get a better idea of how they were helping children in Albany, Corvallis, and surrounding areas, I asked if I could come tour their facility. Jenny and Lynn with ABC House welcomed me with open arms, and the experience left me speechless. To paint a picture of the work they’re doing, I’ll back up to a time before centers like ABC House existed. In the old days, when abuse was suspected in a home, a child would have to tell their story over and over again. Kids, who might have already faced a traumatic event would have to relive that story with lawyers, prosecutors, doctors, counselors, and family members. In many cases, the process of documenting the abuse was almost as bad as the abuse itself. Not to mention, stories are bound to change when you tell it over and over again, so a child’s credibility could be put into question. 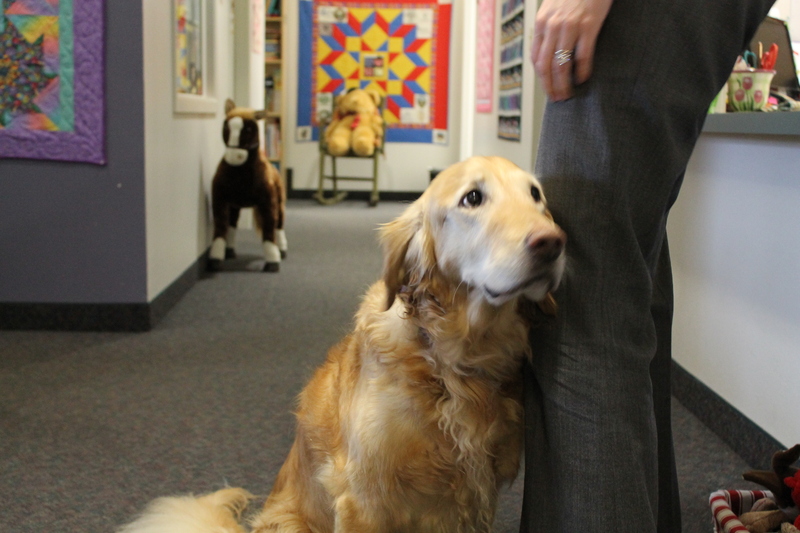 Elsa, the super lovable therapy dog. ABC House was created to put children first, and make them feel safe after they’ve endured abuse. In Linn or Benton County, when abuse is suspected in a home, a child is referred (from a doctor, lawyer, or law enforcement agency) to the ABC House. The center is strategically designed to foster a warm, welcome environment. It’s not cold like a police station or a hospital, but it provides children with the necessary resources to treat and document medical issues, allows them to make a statement to a qualified interviewer, receive on-site counseling, and makes them feel safe the whole time. They have games, stuffed animals, and one of the most adorable therapy dogs I’ve ever met (meet Elsa, picture to the right. She and I were fast friends). While the statements are used to assist in resolving abuse (including court cases), ABC House prides themselves on the fact that when a child leaves their facility, a weight is lifted off their shoulders, and they can start the healing process. A girl who was about 12 years old was being sexually abused in her household. Since she was going through puberty at the time, she started to grow arm hair at the same time the abuse was starting. A very normal part of puberty, but this girl thought her arm hair was growing as a result of the abuse. With that in mind, she thought her arm hair was a signal to the rest of the world that she had been sexually molested. She wore long sleeves constantly, and lived in a steady state of fear that somebody would spot the arm hair. At the ABC House, she finally felt comfortable enough to ask the in-house doctor about her arm hair. Until that point, she didn’t have somebody she could trust enough to ask. The doctor told her it was completely normal, gave her a quick tutorial about what to expect in puberty, and reassured her that she shouldn’t be ashamed of any changes that were happening to her body. After leaving the doctor’s office, she told one of the employees at ABC House how excited she was to finally wear a short-sleeved shirt. According to the people at ABC House, the relief on her face was visible to all who saw her. Every child who leaves ABC House gets their own, hand-made quilt. Perhaps the most heartwarming part of the day came at the end of my tour when I learned that every child who visits ABC House leaves with a stuffed animal, and a handmade quilt. 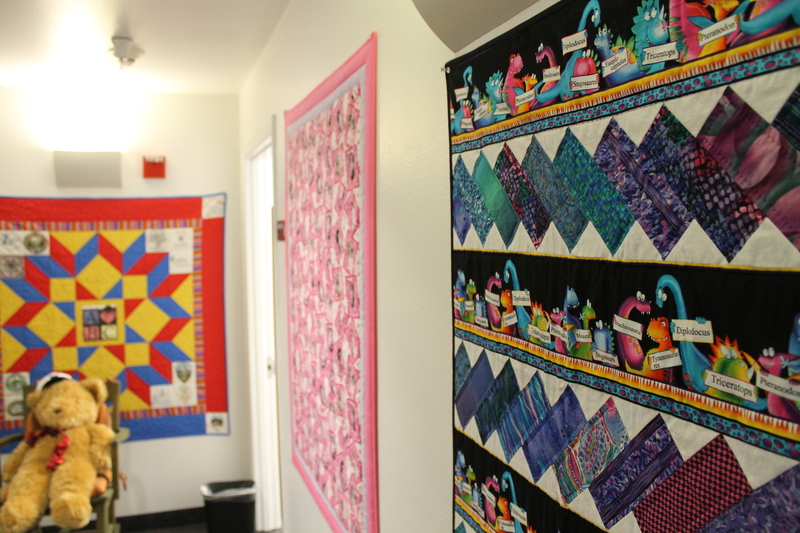 All of the quilts are donated by kind-hearted volunteers in Linn and Benton County who want to make children feel the warmth and safety that comes with a hand-made blanket. Kids literally pull a quilt they like off the wall, and it’s theirs to keep. It’s safe to say I was incredibly moved by the work that they’re doing. While I’m not exactly the warm and fuzzy type, I’ll admit that when I was hearing stories about children who desperately needed help, and received it at ABC House, I was doing the “I have something in my eye” trick (aka the waterworks were flowing). I can’t thank the people at ABC House enough. The work they’re doing is difficult, but it’s vital for the community. I’m thrilled that PacificSource is supporting the Runaway Pumpkin Half Marathon on October 19 this year, which directly benefits ABC House. If you’d like to learn more about the race, and how it helps kids in Linn and Benton County, check out the Runaway Pumpkin Half Marathon Facebook page. And if you’d like to run it, I’ll be there struggling through each mile. I’d love to see you there! This isn’t me, but after week one of my challenge, I felt like the lady in red! Last month, I wrote about my One Month, 100 Mile Challenge. It was a monster, but I completed my challenge! Well, I actually completed it on Cinco de Mayo. I don’t think there is a better way to celebrate a victory than by pouring yourself an ice cold margarita. Which is exactly what I did. I won’t lie though, it was a tough challenge. Especially that first week (which is why I am calling “the learning curve”. Sorry, I couldn’t think of something more clever). Basically, I was running 3.5 miles a day and doing it poorly. It took me a lot of time to realize that it wasn’t that I was a bad runner, it was that I had no idea what I was doing. My form was terrible, I didn’t believe in pacing myself, and I was constantly forgetting how to breath. Still, it was really empowering to know that I could make it. After week one, weeks two, three, and four were cake. By the end of it, four miles felt like nothing. I could have taken on the Eugene Marathon! I could not believe I had actually run 100 miles in just four weeks. Last time I talked to you about tips on how to begin the challenge, this time I want to give you tips for learning how to run. Keep good posture. Shoulders low, arms bent at the elbow but relaxed. I have an issue with tensing up my shoulders, which puts them right next to my ears when I run. A) That’s not a comfortable way to run and B) you get tired of doing it very quickly. Pace yourself. I cannot stress this enough. I would stretch and get so hyped up and ready to run that I would sprint right off the bat. Needless to say I tuckered myself out within the first mile, making the other 2.5 really miserable. 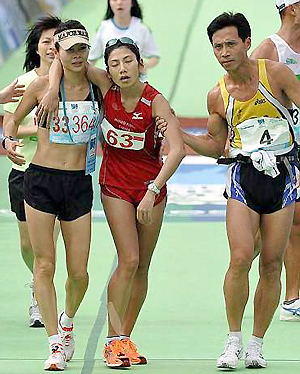 Jogging might take longer but at least you will make it to end without feeling overly exhausted. Get a group. There were so many days I just did not want to make time to run. I just wanted to sit in my bed and be a vegetable. Finding a group of people who are excited about running was so influential. Not only did they hold me accountable, but they got me excited run with them every week. Also don’t forget to breath. I forgot. It was not fun. This was such a great challenge, and I am already planning my second round. I’m really excited to keep running. Who knows, maybe by the end of summer I will run my first half marathon!